Bigasoft AVI to iMovie Converter for Mac helps you to import AVI format videos to iMovie by converting them to iMovie friendly MP4 (MPEG-4), MOV, MP3, WAV, AAC and M4A. Besides, it also support converting other videos including MTS, MKV, FLV, MOD, YouTube videos etc. for you to import to iMovie for edit. 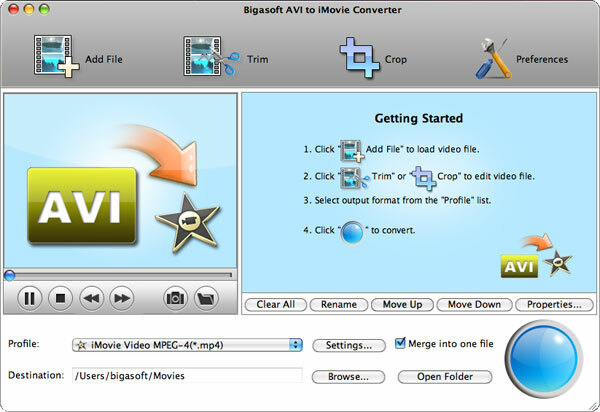 With Bigasoft AVI to iMovie Converter, you can feel free to import AVI and whatever format videos to iMovie '08 and iMovie '09. Convert and import AVI to iMovie with high speed and of great quality. ...... Only a few clicks and very little time you will be able to transfer your AVI videos to iMovie. It supports trimming footages; you can adjust output video by cutting videos into small pieces, removing black edge of movie to best fit for your home video. Convert MPEG to AVI, MP4 to AVI for MAC. Qweas is providing links to Bigasoft AVI to iMovie Converter for Mac 2.1.2.3854 as a courtesy, and makes no representations regarding Bigasoft AVI to iMovie Converter for Mac or any other applications or any information related thereto. Any questions, complaints or claims regarding this application Bigasoft AVI to iMovie Converter for Mac 2.1.2.3854 must be directed to the appropriate software vendor. You may click the publisher link of Bigasoft AVI to iMovie Converter for Mac on the top of this page to get more details about the vendor.